I don't know about you, but I have a particular talent for losing halyards. I don't know how it happens, but invariably it happens fast. One minute you have a perfectly good topping lift. The next you have a coil of rope in your hands and an empty sheave, far, far above your head, spinning in the wind. 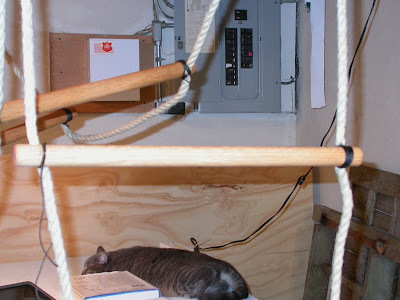 Longtime readers of this blog will remember that Helena and I have already experimented with home-made bosun's chairs. It was so much fun that Helena insisted on giving it a go. This will look dodgy to some people, but actually it's quite safe. 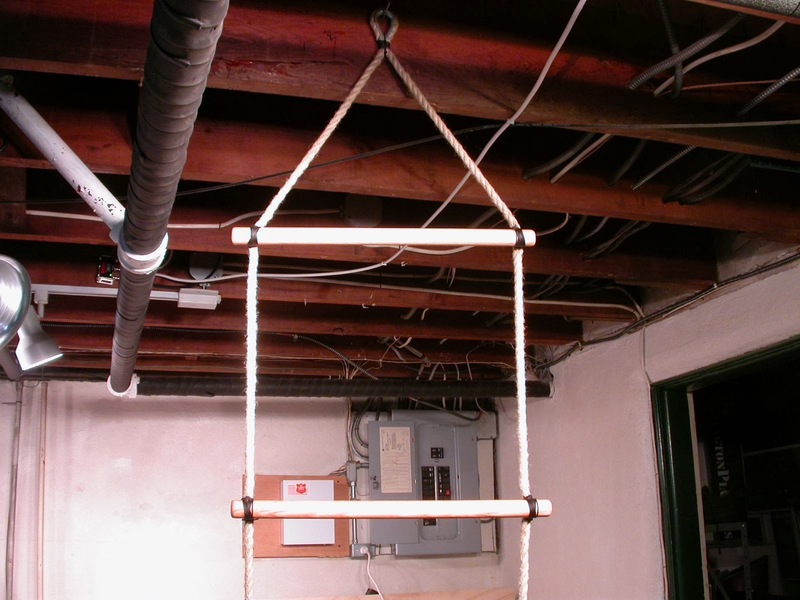 The seat is a very sturdy plank, and the rope that holds it up is crossed and tied under the seat. There's some extra rope coiled up and tied under the seat to keep it from catching on things, so it looks a bit messier than it is. In the impossible case of the seat cracking, the crossed line would hold the thing together long enough to get the victim -- I mean worker -- down safely. 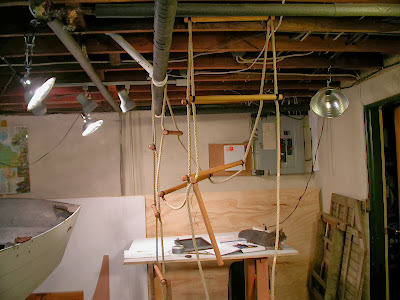 Add a 6x block and tackle, a safety harness attached around the mast, one halyard for the chair and another for the safety harness. Toss in a healthy dose of common sense and you are in business. The big problem with this approach is the 6X block and tackle you need to hoist a full grown person. Even on my short-masted boat, this means threading 200 feet of line through 2 triple blocks. And you can't just thread the line any old way. Because of friction, the line has to follow a specific route through the sheaves that I can't remember without pulling out the books. In short, the bosun chair is the best way to get to the masthead, but it's an all day project. I wanted something simpler and quicker. The inspiration for this project came from watching a fellow sailor climb to the top of his very tall mast on an ordinary household aluminum extension ladder. Well, duh! I thought. How simple is that. That got me thinking of ladders, but I wanted something a little more portable. Something I could stow away down below in case of emergencies far from home and ladders. Then one day, I was thumbing through my "Ashley Book of Knots", and found exactly what I was looking for. enough oak dowel stock to make the rungs. I bought 3' lengths of 1" round stock from Home Depot and cut them in half to make 18" rungs. a thimble for the top. 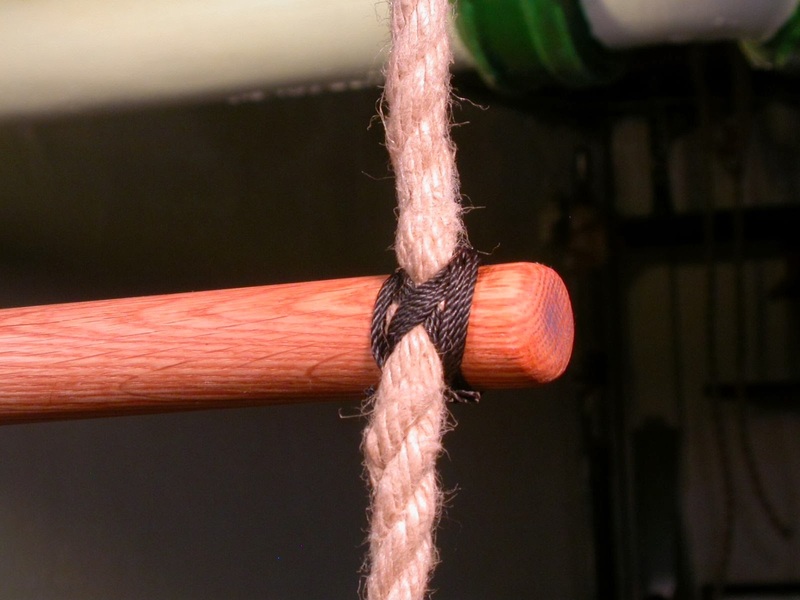 The rope and dowel are probably oversized for strength, but you want something thick enough to hold on to. The 1/2" line and 1" rungs felt just right for my particular death grip. I started by lashing the thimble into the middle of the line, then pre-marked the position of the 15 rungs on both parts of the 'ladder'. To do this, you need to take as much of the stretch out of the line as possible. 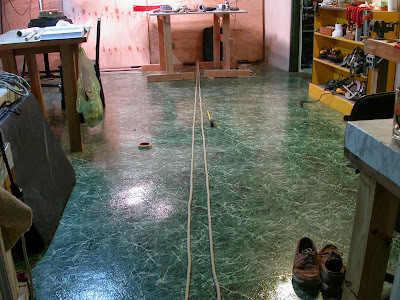 I tied the thimble to a work bench and stretched out the two parts on the floor, parallel to each other. 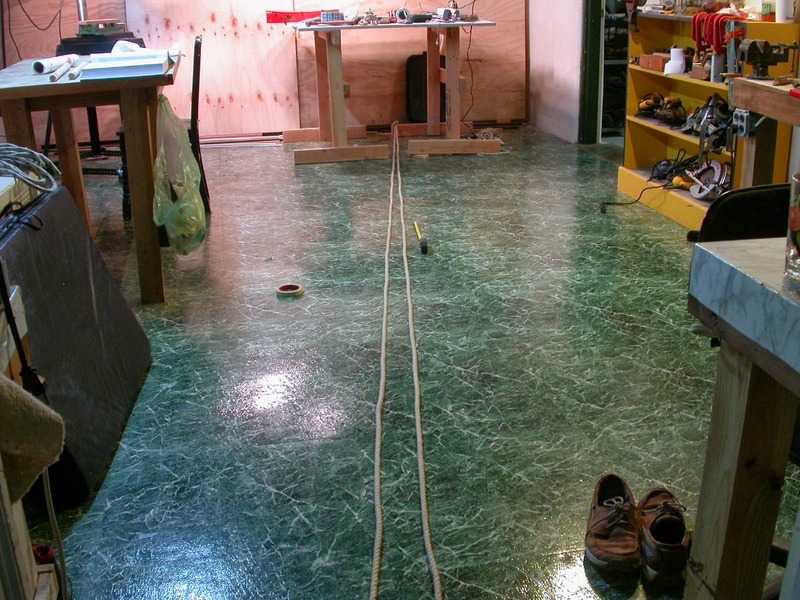 Then I marked off the positions of the rungs, 18" apart, on both lines. The stretch needs to be taken out of both lines evenly before marking. In retrospect, I'd probably reduce the rung spacing a bit -- perhaps to 14" -- but 18" is fine. Once the rungs were marked off, it was time to start lashing. I tried various ways to do this, but the easiest was to suspend the ladder from the ceiling and work on it standing up. At this point, some you are probably saying, Whoa! Lashings?!?! NO WAY I'M TRUSTING MY VALUABLE 200LB CARCASS TO SOME DANG LASHINGS! I forgot to take a picture of this, but to prevent the rung from rolling, I used a half-round rasp to cut a shallow, round notch in each end of the rung. The line is laid in this notch, and then the line and rung are lashed together with 10 good, tight turns. Here are front and back photos of the lashings. I used a simple cross lashing that I also found in Ashley. I suggest you find a copy in the library and study his instructions which are better than I can provide here. As a side note, I gave all the rungs several good rubbings with linseed oil before lashing them on. They don't really need much protection, but I like the smell and look of linseed oil. After you've got a few rungs lashed on, it gets a bit unwieldy. I found it best to keep the part I was working on hanging as straight as possible, with the rest of it out of the way. Plenty of light and a place to hang things is essential. About half-way through the project, I discovered a quick and easy way to make the loose end of the rung fast to the ladder while you lash the other end. 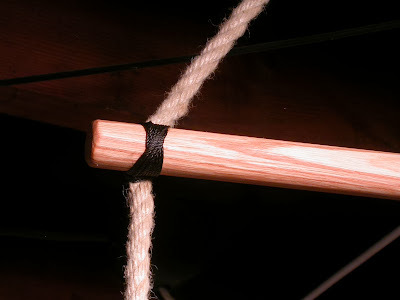 I used the famous Constrictor Knot to lash one end in place temporarily (see photo above), then lashed the other side. It's fast and easy to tie and release the constrictor knot so you can use the same bit of marline over and over again. It's impossible to lash the rung unless the other end is held steady. By the time you are done, you will have perfected your lashing skills, and if you are like me, will be raring to try it out. 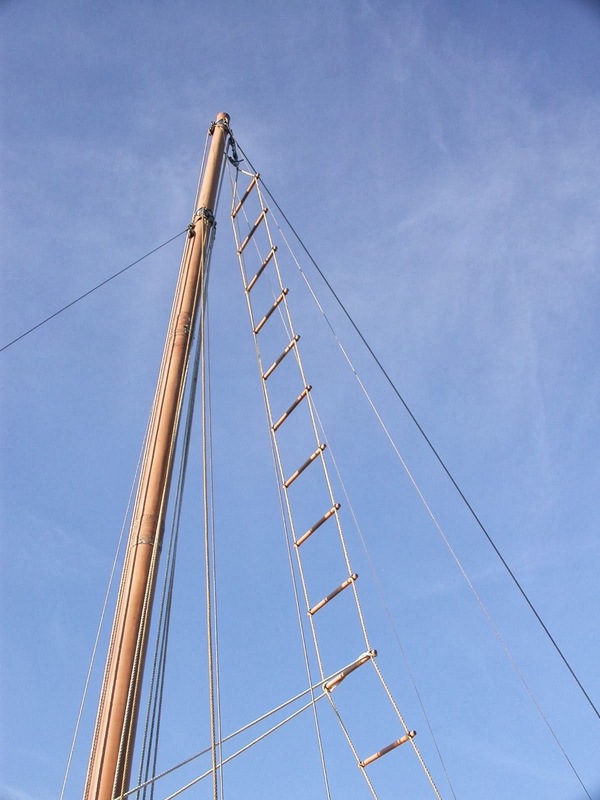 On a calm summer weekday (to minimize powerboat traffic), with Helena in the chase boat, and 911 programmed into speed dial on her cell phone, I proceeded to hoist my lovely ladder up the Blue Moon's mast. Rigging the ladder took a bit of experimentation to get right. I suppose a fit, 20-something could just climb straight up it with no problem, but I wanted it to be a bit more secure than that. 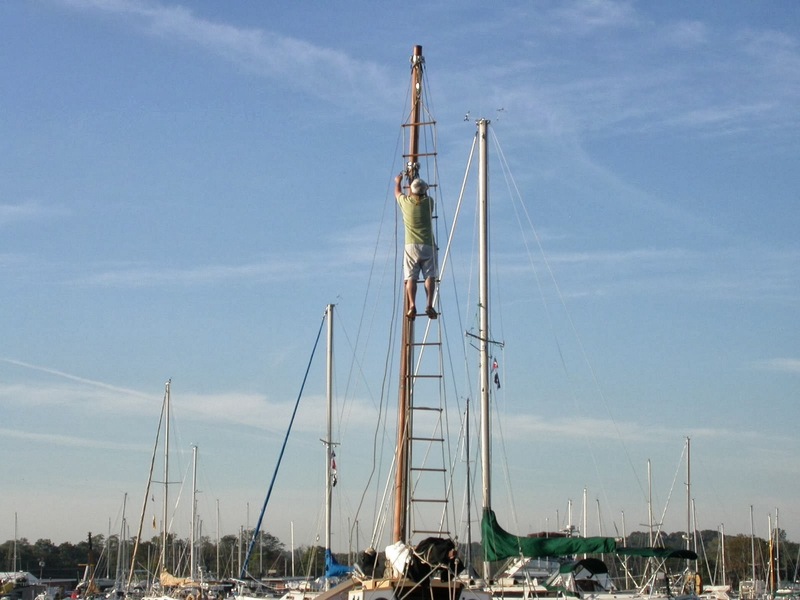 First, I discovered you want the ladder to hang at a bit of angle from the mast. This makes it a lot easier and less scary to climb. Trust me. You also want to tie it down tight, to take the stretch out of it. I tied the ends down tightly in my cockpit, one on either side of the boom. Then, to put even more tension on the ladder, and to prevent it from twisting, I lashed a kind of bridle to the ladder and tied the bridle off on the Sampson post in the bow. See the bridle in the two pictures above. With these precautions in place, the ladder was stiff and easy to climb, even for an old geezer like me. 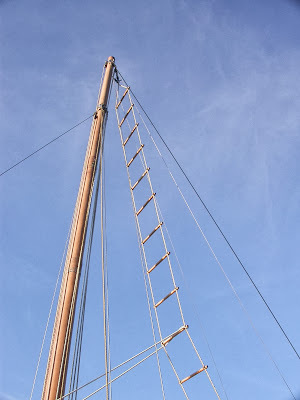 Even with all that tension, the ladder moves in towards the mast as you go up, so you can easily reach it from the ladder. And that was that! 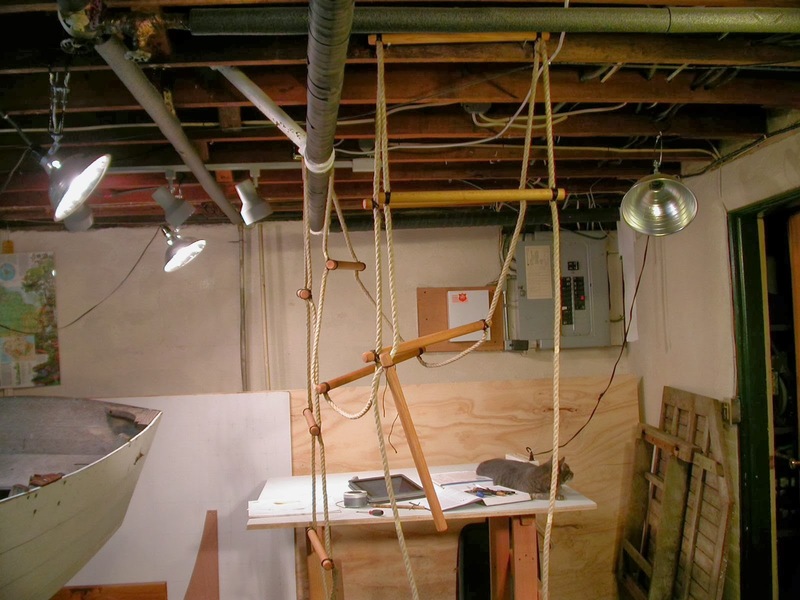 Now that I know how to rig it, the next time, it will take about 10 minutes to hoist and secure. Very salty looking and the envy of my yacht club. 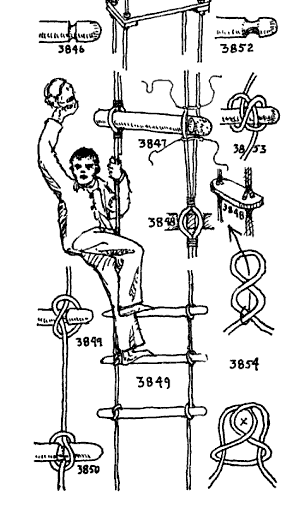 Climbing a free-hanging rope ladder is tricky: if you do it like the chap in Ashley's book, you'll end up upside down (damhikt). Approach the ladder from the side and put one leg each side (fore and aft, if you will). Stand on the rungs heels inward (together). I hadn't thought of anchoring the bottom end with a bridle (not bridal): makes it a lot firmer and easier. Yes, anchoring the ladder and using the bridle (thanks for the spell check) makes it possible for mere mortals to climb. I tried but couldn't manage it when it was just hanging straight up and down. I love the saltiness of it, the devil-may-care lack of redundancy and your trust in your own work. That said, I'm a climber and it scares me. By coincidence I tried a mastaclimba (appalling name) at the London boat show today with my wife tailing the winch and was genuinely impressed. I will however be building a nice little board ladder as a backup from your description. I have redundancy... two hands! I do have trust in my own work... since I lashed each rung myself, I know it's not going to fail, and really, the whole thing is over engineered... no way anything is going to break on it. 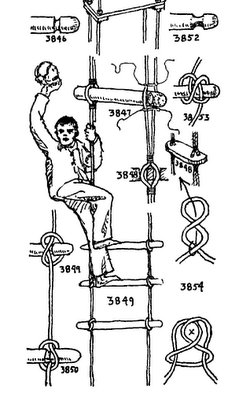 I just read the MastaClimba site... they make it sound very difficult to winch someone to the mast head. I will point out that with the 6x block and tackle, I could actually hoist myself up the mast. That's how powerful it was. The old ways still work pretty darn good. Of course, my mast is relatively short. If I had a 50' mast, I'd think twice, and if I still had the nerve, use a harness attached to an extra halyard. I love it, John. Always looking for a better way to get to the top. 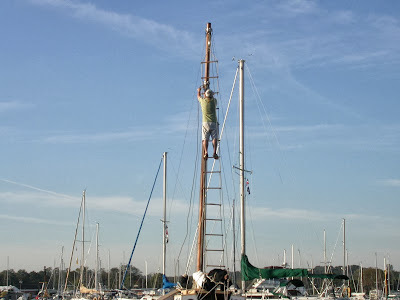 I have ratlines up as far as my spreaders and mast steps the whole length of the mast. 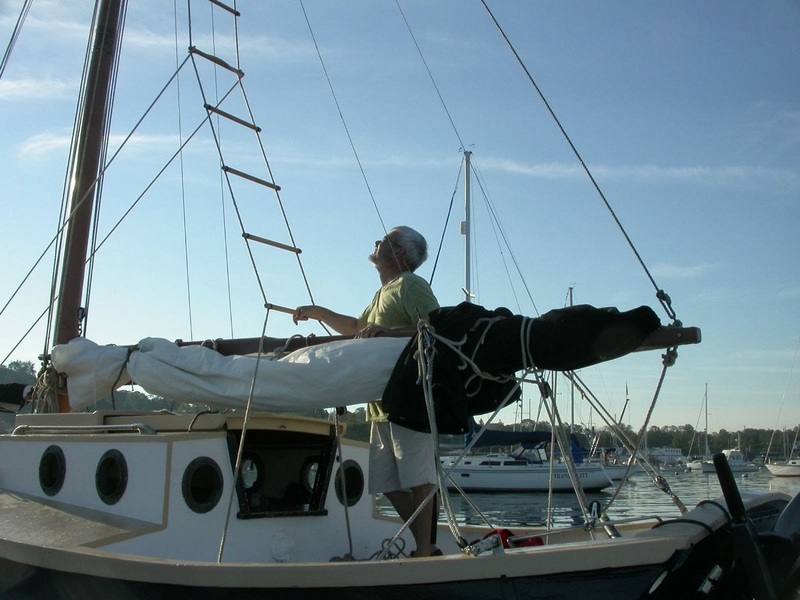 Of course, you can't do mast steps with a regular gaff rig 'cause of the jaws. Can't quite tell from the photos but if you have two shrouds fairly close together you might be able to rig ratlines. I love climbing these as they feel very safe and secure. And, the rungs are lashed on using Brion Toss' instructions. I once bought a piece of gear at a surplus store in Port Townsend (Sir Plus). It was some sort of rope ladder with a hook at one end. 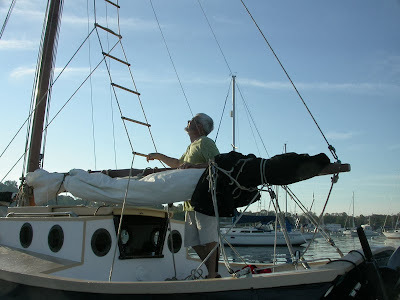 I was going to use it to climb the mast on my 23' gaff-rigged yawl. After I got the German instructions translated, it turned out to be made for snipers. They'd rig the ladder, hang it in a tree, and then, as they hoisted it up, it somehow became a platform to sit on while suspended. Pretty clever but I never did end up using it and sold it with the boat. But, it was a lot like your ladder. I have two shrouds, but one goes to the masthead, and one to the forestay band... just above the gaff jaws when the main is hoisted all the way. The plane of the shrouds is fore and aft at the deck, but turned 90 degrees at the mast, so no good for ratlines, alas. I am going to put pin rails in the shrouds, though. One of these days! For most people this means a trip to a boatyard and massive crane fees, we love how resourceful you are and the fact that it can stow in a duffle bag is even better. People would inspect their rigs more if they had this trick in a bag. Thanks for sharing! Good point. My particular ladder rolls up into about a 1' diameter package. I can easily stow it under my bunk for emergency climbs. Also, I don't need someone to winch me up. It's a one man operation. My 32 foot sloop is also named Blue Moon. I signed the papers to buy her on July 31, 2015, the night of the blue moon.